Original Editors -Nikki Gee from Bellarmine University's Pathophysiology of Complex Patient Problems project. 3. The binge eating and inappropriate compensatory behavior both occur, on average, at least twice a week for 3 months. 4. Self-evaluation is unduly influenced by body shape and weight. 5. The disturbance does not occur exclusively during episodes of anorexia nervosa. Purging type: During the current episode of bulimia nervosa, the person has regularly engaged in self-induced vomiting or the misuse of laxatives, diuretics, or enemas. Nonpurging type: During the current episode of bulimia nervosa, the person has used inappropriate compensatory behavior but has not regularly engaged in self-induced vomiting or misused laxatives, diuretics, or enemas. The incidence of people suffering from bulimia has increased over the last 30-40 years. Around 1 to 2% of females in late adolescence and adult women meet the diagnostic criteria for bulimia nervosa. About 80% of people with bulimia nervosa are female  and 1.5% of American women suffer from bulimia nervosa in their lifetime.. The Standard mortality ratio (SMR) for Bulimia Nervosa is 1.93. Often times bulimia nervosa is also associated with mental health disorders, such as Depression, Anxiety and Substance Abuse. Nearly half of bulimia patients have a comorbid mood disorder, more than half of bulimia patients have comorbid anxiety disorders and nearly 1 in 10 bulimia patients have a comorbid substance abuse disorder, usually alcohol use. Other medications that are gaining recognition for effectiveness include topiramate and ondansetron (Zofran). Topiramate is an anti-convulsant that has been found to be effective in decreasing the frequency of binging and purging , as well as improving the associated psychological co-morbidities. Mild to moderate adverse side effects have been found with using topiramate in patients with bulimia; however this finding was based on a small study and would need further investigation. Ondansetron is an anti-emetic used in cancer patients to help prevent nausea and vomiting. Findings are based on small studies, further investigation is needed to address all aspects of how this anti-emetic could effectively treat bulimia. There have been no specific things proven to cause bulimia. Triggers to bulimia nervosa have been suggested, including dieting, stress, emotions, and the need for control (to ease stress or anxiety in a person's life). Factors that are suggested to contribute to bulimia include culture, family history, stressful life event, personality, and biology. Rarely it is one factor in causing bulimia, often it is found that genetics, psychological factors, family and societal pressures, and/or cultural influences. A recent study by Luther et al reported that glucagon-like peptide 1 (GLP1) levels are low in patients with bulima nervosa. Irregular heartbeat, heart failure, and death can occur secondary to the imbalances due to loss of essential nutrients and electrolyte imbalances." Some patients choose to be treated without mental health professionals, while others only recieve treatment from mental health professionals. Psychotherapy includes cognitive-behavoiral therapy, behavior therapy, family therapy, and interpersonal psychotherapy. Some patients are successful with short-term treatments such as these, others require long-term. Some patients diagnosed with bulimia have complications secondary to their disorder, thus requiring treatment beyond that for their eating disorder. These treatments vary according to the severity of systemic involvement and complications. Comorbid psychiatric illness (suicidal, depressed, unable to care for self, etc.)" "Are you satisfied with your eating patterns? Do you force yourself to exercises, even when you don’t feel well? Do you exercise more when you eat more? Do you think you will gain weight if you stop exercising for a day or two? Do you exercise more than once a day? Do you take laxatives/diuretics/any other pills as a way to control your weight or shape? Do you ever eat in secret (i.e. in closets or bathrooms to avoid being seen eating)? Are there days when you don’t eat anything? Do you ever make yourself throw up after eating as a way to control your weight?" One point is given for every ‘yes’ answer. A score of two or more indicates possible anorexia nervosa or bulimia nervosa. *Note: 1 stone is approximately 6.35 kg"
Central Nervous System pathologies (i.e. brain tumors) can stimulate bulimia. Kluver-Bucy Syndrome (symptoms include hyperphagia, hypersexuality, and compulsive licking and biting) and Klein-Levin Syndrome (more common in men; symptoms include hyperphagia and period hypersomnia) should be ruled out. Patients must be screened carefully to correctly diagnose bulimia, versus the purge subtype of anorexia nervosa. Patients with borderline personality disorder may present with binge eating tendencies; however, these patients will not meet the other diagnostic criteria for bulimia. Schapman-Williams AM, Lock J. Using Cognitive-Behavioral Therapy to Treat Adolescent-Onset Bulimia Nervosa: A Case Study. Clinical Case Studies. December 2007; 6(6):508-524. Abstract: "This case study describes the treatment of an adolescent female, referred to as Susan, who presented for evaluation at the Eating Disorders Clinic of Child and Adolescent Psychiatry at Stanford University. Susan presented with symptoms of body image disturbance, dietary restriction, binge eating, self-inducted vomiting, and overexercise, and was diagnosed with bulimia nervosa (BN). She was treated with 20 sessions of manualized cognitive-behavioral therapy (CBT) for BN adjusted for adolescents. Susan’s progress throughout treatment is detailed in this case study report. Results lend support to a scant body of case series studies attesting to the efficacy of CBT for use with adolescents with BN. Large-scale, randomized studies are needed to corroborate preliminary conclusions that have been promulgated in this case study." Schmidt U, et al. A Randomized Controlled Trial of Family Therapy and Cognitive Behavior Therapy Guided Self-Care for Adolescents with Bulimia Nervosa and Related Disorders. Am J Psychiatry. 2007; 164:591-598. Abstract: Objective: To date no trial has focused on the treatment of adolescents with bulimia nervosa. The aim of this study was to compare the efficacy and cost-effectiveness of family therapy and cognitive behavior therapy (CBT) guided self-care in adolescents with bulimia nervosa or eating disorder not otherwise specified. Method: Eighty-five adolescents with bulimia nervosa or eating disorder not otherwise specified were recruited from eating disorder services in the United Kingdom. Participants were randomly assigned to family therapy for bulimia nervosa or individual CBT guided self-care supported by a health professional. The primary outcome measures were abstinence from binge eating and vomiting, as assessed by interview at end of treatment (6 months) and again at 12 months. Secondary outcome measures included other bulimic symptoms and cost of care. Results: Of the 85 study participants, 41 were assigned to family therapy and 44 to CBT guided self-care. At 6 months, bingeing had undergone a significantly greater reduction in the guided self-care group than in the family therapy group; however, this difference disappeared at 12 months. There were no other differences between groups in behavioral or attitudinal eating disorder symptoms. The direct cost of treatment was lower for guided self-care than for family therapy. The two treatments did not differ in other cost categories. Conclusions: Compared with family therapy, CBT guided self-care has the slight advantage of offering a more rapid reduction of bingeing, lower cost, and greater acceptability for adolescents with bulimia or eating disorder not otherwise specified. ↑ 1.0 1.1 1.2 Office on Women's Health in the U.S. Department of Health and Human Services. 2009. Available from: U.S. Department of Health and Human Services, Web site: http://www.womenshealth.gov/faq/bulimia-nervosa.cfm. Accessed February 2010. ↑ 4.0 4.1 4.2 4.3 4.4 4.5 4.6 4.7 4.8 Academy for Eating Disorders. Website: http://www.aedweb.org/eating_disorders/index.cfm. Accessed February 2010. ↑ 5.0 5.1 5.2 National Eating Disorders Association. Web site: http://www.nationaleatingdisorders.org/nedaDir/files/documents/handouts/Bulimia.pdf. Accessed February 2010. ↑ Hudson, J. I., Hiripi, E., Pope, H. G., & Kessler, R. C. (2007). The prevalence and correlates of eating disorders in the national comorbidity survey replication. Biological Psychiatry, 61(3), 348–358. ↑ Arcelus, J., Mitchell, A. J., Wales, J., & Nielsen, S. (2011). Mortality rates in patients with anorexia nervosa and other eating disorders: a meta-analysis of 36 studies. Archives of General Psychiatry, 68(7), 724-731. ↑ 8.0 8.1 Office on Women's Health in the U.S. Department of Health and Human Services. 2009. 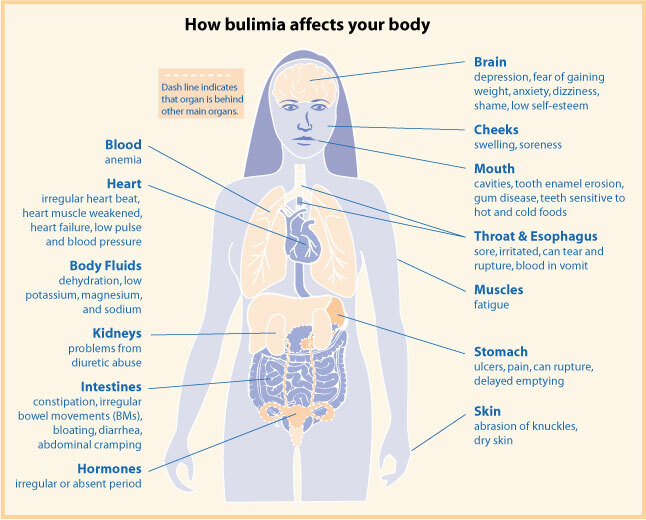 Available from: U.S. Department of Health and Human Services, Web site: http://www.womenshealth.gov/faq/bulimia-nervosa.cfm. Accessed February 2010. ↑ 9.0 9.1 9.2 9.3 Goodman CC & Snyder TE Differential Diagnosis for Physical Therapists: Screening for Referral. 4th ed. St. Louis, Missouri: Saunders Elsevier; 2007. ↑ 10.0 10.1 10.2 Ulfvebrand, S., Birgegard, A., Norring, C., Hogdahl, L., & von Hausswolff-Juhlin, Y. (2015). Psychiatric comorbidity in women and men with eating disorders results from a large clinical database. Psychiatry Research, 230(2), 294-299. ↑ 11.0 11.1 Williams P., Goodie J., Motsinger C.. Treating Eating Disorders in Primary Care. American Family Physician. 2008 Jan 15;77(2): 187-95. In: ProQuest Health and Medical Complete [database on the Internet] [cited 2010 Apr 5]. Available from: http://www.proquest.com/; Document ID: 1432620761. ↑ 12.0 12.1 Trunko M., Kaye W.. Pharmacological Treatment of Bulimia Nervosa: A Review of Available Medications. Psychiatric Times. 2008 May 1;25(6): 52,56-58. In: ProQuest Nursing & Allied Health Source [database on the Internet] [cited 2010 Apr 5]. Available from: http://www.proquest.com/; Document ID: 1769161331. ↑ 13.0 13.1 13.2 Van Voorhees BW, Zieve D. Bulimia: MedlinePlus Medical Encyclopedia. Last Updated Jan. 25, 2010. Available from: U.S. National Library of Medicine and the National Institutes of Health, Web site: http://www.nlm.nih.gov/medlineplus/ency/article/000341.htm. Accessed February 2010. ↑ United States Department of Health and Human Services- Substance Abuse and Mental Health Services Administration, Available at: http://mentalhealth.samhsa.gov/publications/allpubs/ken98-0047/default.asp#4. Accessed February 2010. ↑ Jayasekara R.. Bulimia Nervosa: Management. Evidence Summaries - Joanna Briggs Institute. 2007 Oct 10. In: Evidence-Based Resources from the Joanna Briggs Institute [database on the Internet] [cited 2010 Apr 5]. Available from: http://www.proquest.com/; Document ID: 1451761891. ↑ American Physical Therapy Association. Guide to Physical Therapist Practice. 2nd ed. Alexandria, Virginia: American Physical Therapy Association; 2003. ↑ 21.0 21.1 21.2 Goodman CC & Fuller KS Pathology: Implications for the Physical Therapist. 3rd ed. St. Louis, Missouri: Saunders Elsevier; 2009. ↑ Hay P. Understanding bulimia. Australian Family Physician. 2007 Sep 1;36(9): 708-12, 731. In: ProQuest Health and Medical Complete [database on the Internet] [cited 2010 Apr 5]. Available from: http://www.proquest.com/; Document ID: 1617589531. ↑ Carei TR, et al. Randomized Controlled Clinical Trial of Yoga in the Treatment of Eating Disorders. J Adolesc Health. April 2010; 46 (4): 346-51.